The Three of Cups is a card of celebration and accomplishment. Three young maidens dance in a circle with their golden goblets upraised in a toast of joy. Their arms reach out to each other and they connect through their emotions and their friendship with one another. The ground is covered with fruit and there is a general sense of abundance and happiness. 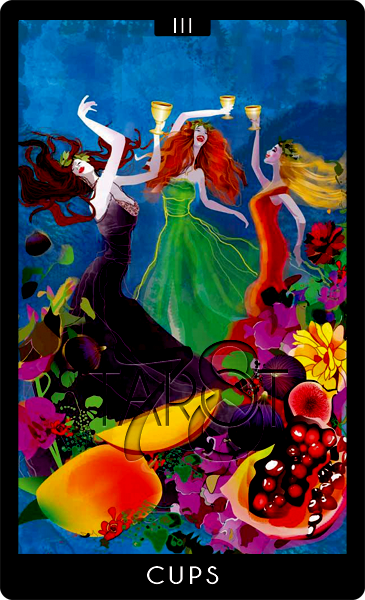 Each woman in the Three of Cups has a wreath of laurel on her head. Wreaths of this type have long been a symbol of victory and success. A sweet smelling laurel wreath is also a symbol of protection, peace and purification and is a message that the favour of the Universe is upon us, and that we shall be the victor in this stage of our lives. At the women’s feet lie various flowers, symbolising joy, beauty, compassion and growth. The flowers remind us of the good times in life, the sweet smell of success, and the beauty that surrounds us if only we open up to its presence.